In our outgoing, type A business culture, introverts can feel excluded, overlooked, or misunderstood, their reticence mistaken for reluctance, arrogance, or even lack of intelligence. But Jennifer Kahnweiler shows that not only can introversion be managed, it can even be a source of strength. Ask Bill Gates and Warren Buffett, two of the leaders she cites as shy introspectives who have developed ways to thrive in a challenging environment. It is estimated that as many as 40 percent of executives are introverted to at least some extent. Based on conversations with over 100 of these men and women, Kahnweiler lays out a progressive four-step strategy for succeeding in an extroverted world. First, preparation: carefully devise a game plan for any potentially anxiety-producing situation. Then, presence: knowing that you’re prepared, be completely focused on the present moment or activity. Next, push: with a firm foundation of preparation and presence, go beyond your comfort zone. And finally, practice, practice, practice. 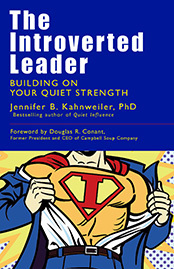 After a revealing Introverted Leader Quiz to help you deepen your understanding of where focused improvement will produce maximum results, Kahnweiler shows exactly how to apply the four Ps approach in six areas that are particularly difficult for introverts, such as public speaking, heading up projects, participating in meetings, and more. The goal, she emphasizes, is not personality change—you work with who you are, not against it. In fact, she shows that introversion can actually be a plus in areas like listening skills and written communication. But as a result of reading this book, leaders and aspiring leaders who find it intimidating to be around people will learn to embrace the experience, rather than see it as something to be avoided or endured, and as a result advance their careers and contribute more fully to their organizations.